By this point, every world leader has heard tell of Donald Trump and his infamous yanking handshake. It’s billed as a power move, though my personal theory is that his hands are just too small for individual finger control, and therefore simply clamp onto their victims like a ribbon snake’s little jaws clamp onto a guppy. God, that was like watching two squids mate. 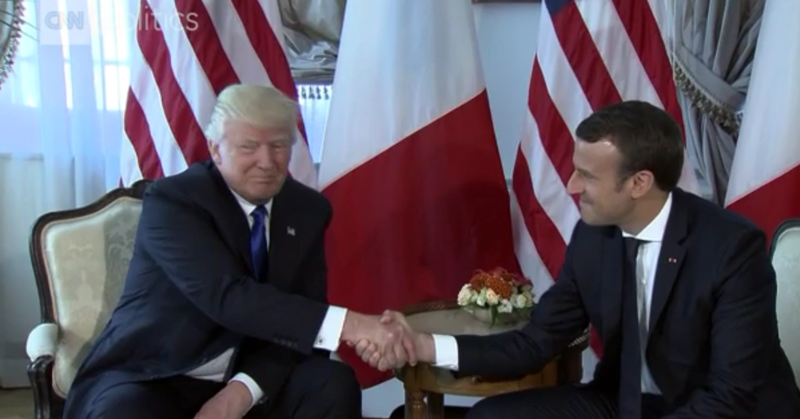 The best part comes at the end, after Macron has finished pulverizing each of Trump’s phalanges, when the American Meatloaf tries to pull his decimated paw out of Macron’s iron grip. “Not now, ma petite saucisse,” Macron says with his eyes, holding on tight. Eventually, after something like 20 hours of struggle, the hands are released. The conclusion of the sit-down probably saw them both retreat back to their corners for medical aid and an ice bath, prizefighter-style. True, true. It’s hard to imagine that Trump’s hands are that strong anyway, since it’s not like he exercises them or fills his body with anything other than meat and heavy creams. So what’s next for the handshake chronicles? No one knows for sure, but I’d like to see Angela Merkel bite one of them off.